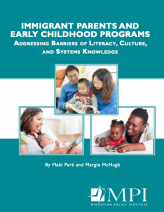 Immigrant parents face significant barriers as they try to engage with their children's early educational experiences, including greatly restricted access for many due to limited English proficiency and functional literacy. Parental engagement is critical for young children's early cognitive and socioemotional development, and for their participation in programs that are designed to support early learning. Reducing the barriers to parent engagement in early childhood education and care (ECEC) programs would encourage school success, and help many young children of immigrants close the gaps in kindergarten readiness with their native peers. Recent years have seen a rapid increase in the size and share of the U.S. young-child population with at least one immigrant parent, posing challenges to policymakers and front-line programs in the early childhood arena. These demographic changes are converging with efforts in many states to expand early childhood services and improve their quality. With one in four young children in the United States living in an immigrant family, efforts to build trust and establish meaningful two-way communication with these families is an urgent priority if system expansion efforts are to realize their purpose. Many programs face difficulties engaging with immigrant and refugee parents who often require support building U.S. cultural and systems knowledge and in overcoming English language and literacy barriers. These difficulties have been exacerbated in recent years as adult basic education and English instruction programs, which early childhood programs such as Head Start had previously relied on to support parents in need of these skills, have been significantly reduced. Against this backdrop, this report identifies the unique needs of newcomer parents across the range of expectations for parent skill, engagement, and leadership sought by ECEC programs, and strategies undertaken to address these needs. The study is based on field research in six states, expert interviews, a literature review, and a sociodemographic analysis.